Ambassador Kent, guest speaker at a networking luncheon hosted by Skål International Bangkok, was responding to comments made by Club President Dale Lawrence that the Tourism Authority of Thailand’s marketing efforts in the United Kingdom were finally paying dividends. The TAT has been pitching Thailand as much more than merely a summer destination for British holiday makers. 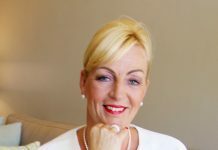 Kent noted the increasing popularity of Thailand amongst UK nationals with the TAT forecasting some 838,000 arrivals from the United Kingdom for calendar year 2013. He welcomed the news that the average length of stay by Brits in Thailand (17 days) was above average with a significant average daily spend of Baht 3,800. 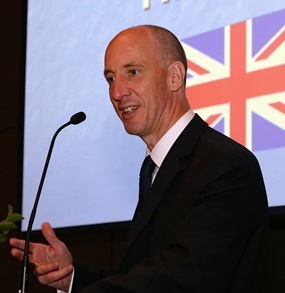 Britain’s Ambassador to Thailand Mark Kent addresses Skål International Bangkok. He warned of the dangers of travelling without adequate health insurance but refused to be drawn on the Thai government’s proposed compulsory Baht 500 health insurance scheme. The Ambassador told the Skål Bangkok luncheon group that most injuries and fatalities amongst UK nationals visiting Thailand were as a result of motor bike accidents where the victims were not wearing helmets. Asked about the proposed rail infrastructure programme across Thailand, Kent said that this would undoubtedly benefit the country as a whole and added that he was pushing for the Thai government to tap into the considerable rail engineering and design consultancy expertise offered by British companies. Finally, Kent acknowledged that the British Government had sometimes overreacted to events when issuing travel advisories via the official Foreign and Commonwealth website but he believed that the Embassy staff in Bangkok were very much in tune with local events. He added that his team uses social media channels such as Facebook and Twitter to reach as many travellers and UK ex-pats as possible.